Introduction To improve temporal and spatial resolution in optical imaging in cardiac electrophysiology we used a second generation complementary metal–oxide–semiconductor camera and novel algorithms to analyse electrical activation. Methods Murine hearts were perfused with Krebs-Henseleit (KHB) solution containing a voltage sensitive dye Di-4-Anepps. Isolated left atria (LA) superfused with KHB containing an excitation-contraction uncoupler blebbistatin were illuminated with 530 nm LEDs and stimulated from 80–300 ms cycle lengths. Emitted light was recorded using the camera mounted on an image splitter housing a 630 nm filter. Images were recorded at 1 and 2 kHz and analysed for activation patterns and action potential durations (APD) using customised algorithms. Activation mapping was performed by automatically generating isochronal maps. 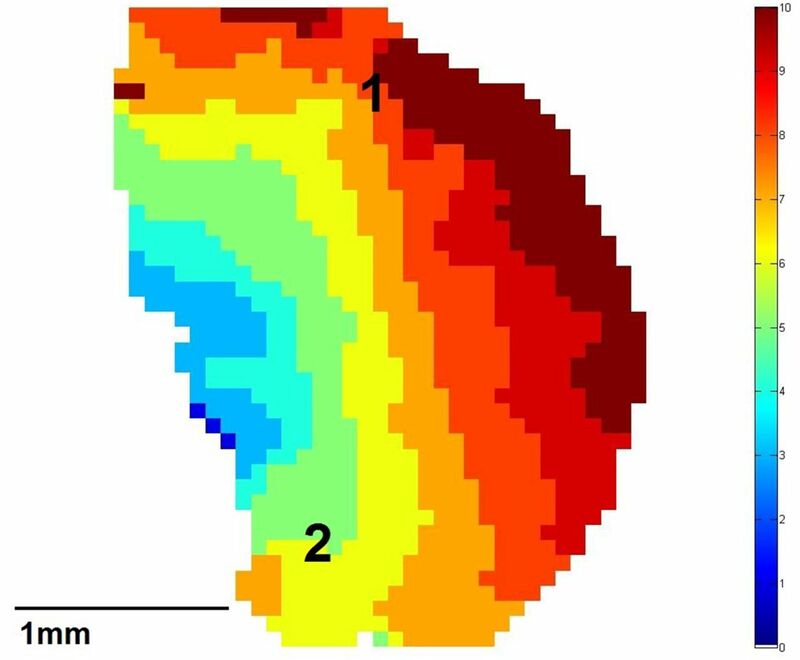 To assess regional variation of APD, 20 equally sized regions were imaged on the atrial surface. APDs were taken from each region during steady state pacing. Customised algorithms performed automated baseline drift correction, signal averaging and measured APD values without user bias. Results Activation during left atrial pacing was relatively homogeneous with a mean velocity of 28.8 ± 3.9 cm/sec (n = 5, see figure for activation pattern) and a maximum activation time of 10ms. LA APD30, 50, 70 were 5.1 ± 0.2, 7.1 ± 0.3, 9.9 ± 0.1 ms respectively (n = 4, mean ± SEM). Comparing two distant regions on the LA (labelled 1 and 2 on figure) APD70 were 8.5 ± 0.8 and 12.5 ± 1 ms (p < 0.05). Conclusion We demonstrate quantification of conduction and multi-site analysis of APDs by optical mapping in the murine LA. There is an important regional LA APD variation. Further studies are warranted to understand the relevance of regional APD differences for atrial arrhythmias such as atrial fibrillation.